I explore the River Greta and its meeting with the Tees at Rokeby. The film is inspired by Walter Scott’s narrative poem Rokeby (1813) in which dramatic historical events play out across the semi-wild country of Upper Teesdale near Barnard Castle. The area and Scott’s poem inspired famous paintings by Turner and Cotman, and the spirit of Romanticism survives in the secluded valley. 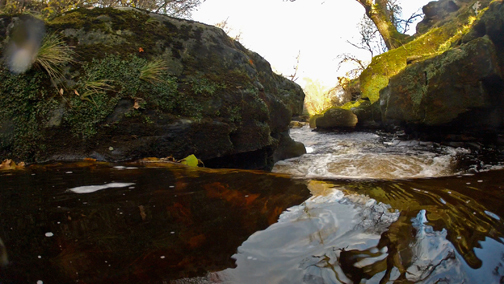 The film’s title is taken from the first line of one of the minstrel songs in the poem: ‘O Brignall banks are wild and fair’, and the film itself follows the course of the River Greta through Brignall woods and under Greta Bridge to the Meeting of the Waters. Picturesque Scenes of the woodland and Brignall’s ruined church contrast with the turbulent life of the river, as the camera is swept along in an exhilaration of movement by the Sublime power of the elements.